Accumoto's own Mark White is signed by Prairie Hills Motorsport Club! Posted (02/10/2008) - Mark joins his new sponsor Prairie Hills Motorsport Club at the 2008 Chicago Auto Show with his APR Motorsport teammates, Randy Pobst and Ian Baas. 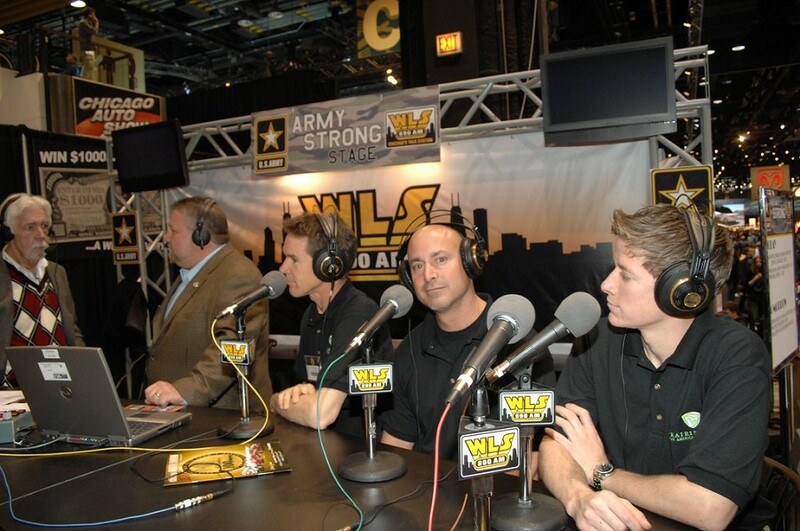 The trio were on hand for signing autographs and an appearance on WLS radio. CEO Michael Krupka signs Randy Pobst, Ian Baas, and Mark White as the first Prairie Hills Motorsport Club pro drivers. HINSDALE, IL - Prairie Hills Motorsport Club has announced the addition to its staff three of the most respected racing drivers in America. Randy Pobst, Ian Baas, and Mark White, who drive for APR Motorsport, have joined Prairie Hills as "Club Pros" to represent America's premier racing facility. The European style course will be the longest in the Western Hemisphere and is being designed by a team of the most respected track designers in racing. Michael Krupka, CEO and Founder, said at the briefing, "We are making an extraordinary commitment in bringing on the most competitive drivers to be a part of our team. Randy, Ian, and Mark are also supported by Team Janica Racing, one of our partners, and a leader in the training and education of motorsports enthusiasts." SCCA National Runoffs, and SPEED World Challenge Series titles. In 2007, Pobst drove in both World Challenge Series missing winning both championships because of a last lap, last race mishap in the TC race. Pobst has been a Porsche Factory team driver, driving coach, and regular columnist in Sports Car magazine. Add two Daytona 24 Hour wins and several Grand Am Rolex GT Series wins to his resume and you have a driver who has truly left his mark on racing. career in open-wheeled road racers at 18, Baas has a depth of experience unusual for a driver of his young age. Now 24, he most recently competed in the SPEED World Challenge Touring Car Series and Grand American Sportscar Series in 2007. In 2006, he won the GT class in the Rolex 24 Hours of Daytona and was on the podium regularly in the Porsche Carrera Cup of Germany and the Porsche Super Cup races. Ian also drove alongside Pobst in a number of races in the 2005 American Le Mans Series racing a Porsche 911 GT3 RSR earning the Founder's Cup for Excellence in Driving. Car Series GT Class, White claimed the IMSA Championship, 10 podiums out of 12 starts, multiple race fast laps, and several lap records in the process. In addition, Mark's enthusiasm and talent have earned him guest instructor positions and an ongoing business relationship with a major automotive manufacturer. For 2008, Mark, Randy, and Ian will be teammates driving Volkswagen GTI's in the highly competitive KONI Challenge Series.